On-line registration of application commences on 01-08-2018 (10:00 Hrs) and closes on 21-08-2018 (17:00 Hrs). 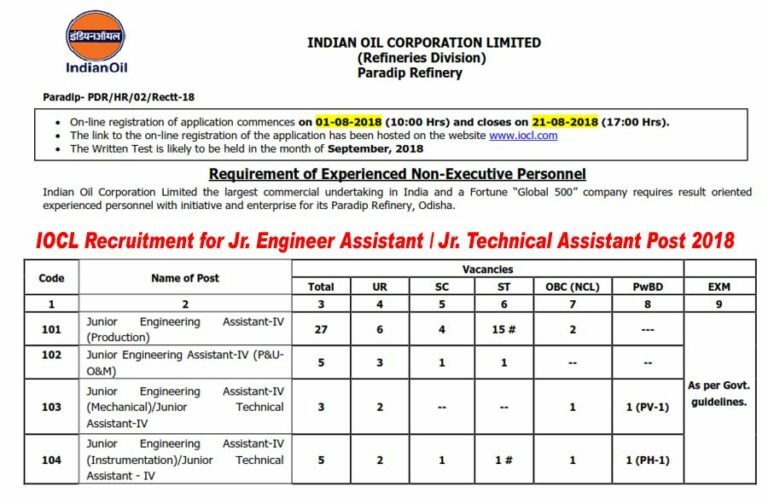 Junior Engineering Assistant-IV (Production): 3 years Diploma in Chemical/ Refinery & Petrochemical Engg. or B.Sc. (Maths, Physics, Chemistry or Industrial Chemistry) from a recognized Institute/ University with a minimum of 50% marks in aggregate for General & OBC candidates & 45% marks in aggregate in case of SC/ST candidates against reserved positions. Junior Engineering Assistant-IV (P&UO&M):3 years Diploma in Electrical Engineering from recognized Institute/ University with a minimum of 50% marks in aggregate for General & OBC candidates & 45% marks in aggregate in case of SC/ST candidates against reserved positions. Junior Engineering Assistant-IV (Mechanical)/Junior Technical Assistant-IV: 3 years Diploma in Mechanical Engineering from recognized Institute/ University with minimum of 50% marks in aggregate for General, SC, ST & OBC candidates & 45% marks in aggregate in case of PwBD candidates against reserved/ identified for PwBD positions or Matric with ITI in Fitter Trade with Pass class. Junior Engineering Assistant-IV (Instrumentation)/Junior Technical Assistant – IV: 3 years Diploma in Instrumentation/ Instrumentation & Electronics/ Instrumentation & Control Engineering from a recognized Institute/ University with minimum of 50% marks in aggregate for General & OBC candidates & 45% marks in aggregate in case of SC/ST/PwBD candidates against reserved/identified for PwBD positions. Age Limit: 18 years & Maximum age shall be 26 years for General candidates as on 31-07-2018. Selection Process: The selection methodology will comprise Written Test and a Skill/Proficiency/Physical Test (SPPT) which will be of qualifying nature. How to Apply: Interested Candidates may Apply Online Through official Website. After successfully applying / registering on-line applications, the candidates must take a printout of the filled in online application form. The printout along with all supporting documents under self-attestation & a photograph as mentioned in the check list attached to the application form including proof of payment of application fees (if applicable) is required to be sent by ordinary post to The Advertiser, General Post Office (GPO), Post Box. No. 145, Bhubaneswar – 751 001, duly signed by him/her so as to reach us by 30-08-2018. Applications sent through Registered post / Speed Post / Courier shall not be accepted by the Post Office.